Welcome to The PlayStation Classics! This is a weekly column where I’ll be going over the PS One Classics and PS2 Classics you should know about for your PlayStation 4, PlayStation 3, or PlayStation Portable. Since SNK Heroines: Tag Team Frenzy is out this week, we’re going to kick things off with another SNK fighter. Let’s say you aren’t up for the fanservice that an all-girls game will offer. Maybe you want something a little strenuous that will really test your skill? Well, The King of Fighters Collection: The Orochi Saga, a game added to the PlayStation Store back on June 26, 2018, could be the way to go. The King of Fighters Collection: The Orochi Saga is an absolutely massive game. This is a compilation of all the games that cover the series’ Orochi storyline arc. Well, mostly, but we’ll get into that in a moment. When you buy it, you get The King of Fighters ’94, The King of Fighters ’95, The King of Fighters ’96, The King of Fighters ’97, and The King of Fighters ’98. As you can gather, from it being a PS2 Classic, it originally appeared on the PlayStation 2 worldwide. It also appeared on the PlayStation Portable and Wii too! Now, when you get this game, you need to remember that it came out before companies started doing the whole exceptional remake/remaster thing. What you are basically getting is a pack of five The King of Fighters games all smooshed together, with a few extra Challenges, a gallery where you can see some of the designs made during its development, and a place where you can listen to a number of tracks taken from the games. You also get to see some great borders as you play, so there isn’t always tons of blank space around the action. By this point, you might be wondering why this The King of Fighters collection has “The Orochi Saga” as its subtitle. It refers to the storyline running through most of the games in this compilation. The King of Fighters ’94 is the game that started it all and introduced The King of Fighters Tournament that would provide an excuse for people to get together and duke it out in every installment, but it was The King of Fighters ’95 that introduced the idea that there were three important families in the series that hold artifacts that keep Orochi, a mythical eight-headed serpent, sealed away. Of course, The King of Fighters ’95 didn’t get into the whole “there was a legendary dragon with eight heads that wreaked havoc on the world” right away. Instead, that game was about establishing a rivalry. It was here that Kyo, heir of the Kusanagi clan and holder of the Kusanagi Sword, met Iori, heir of the Yagami clan and holder of the Yasakani Jewel. 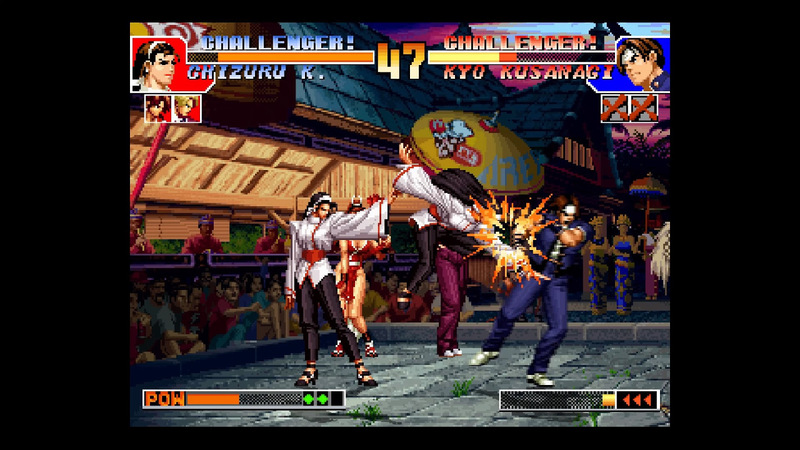 In The King of Fighters ’96, Kyo and the members of Hero team join the tournament to find the mystery man who beat Kyo up good, while Orochi agents Mature and Vice join up with Iori, as he wants to kill Kyo, and they want to use him for ulterior motives. But why does Iori want to kill Kyo? It all has to do with a plan Orochi’s followers set in motion to weaken his seal and resurrect the dragon. Years ago, the Kusanagi, Yasakani, and Yata clans were going to move Orochi’s vessel to try and maintain the seal on it. Orochi’s followers killed the leader of the Yasakani clan’s wife, then set up and blamed the Kusanagi clan. This led to the Yasakani clan making a pact with Orochi to tap into his power and get a special technique, becoming the Yagami clan in the process. The Orochi arc actually ends in The King of Fighters ’97. This installment builds to a reconciliation of the three families and the subsequent resurrection and defeat of Orochi. Thus, destiny brings Kyo, Iori, and Chizuru (Yata) Kagura together again. Though Kyo, Iori, and Chizuru join the tournament for different reasons, the story sees the clans’ artifacts doing what is necessary to seal away evil again. As for The King of Fighters ’98, it is an odd man out, like The King of Fighters ’94. It actually does not have any storyline that connects it to the Orochi storyline. But, it does give people a chance to see characters from the previous four games all come together for brawls, which might be reason enough for it to exist and appear here. Do you feel like you’ve just got to play The King of Fighters Collection: The Orochi Saga now? Well, people in North America and Europe can right now! It is on the PlayStation 4 as a PS Classic. It will cost you $14.99/£11.99. Unfortunately, it was only released as a PS2 Classic on the PlayStation 3 in Japan.